Fashion designers create clothing and accessories for consumers. They conceive ideas and then see them through until they become finished products such as dresses, suits, blouses, shirts, pants, handbags, and shoes. Some fashion designers specialize in costume design, creating wardrobes to be worn in movies, television shows, and theater productions. Do you have the characteristics to be successful in this career? Let's find out. Do You Have What It Takes to Be a Fashion Designer? If you were to ask, "Must I go to college if I want to be a fashion designer?" the answer would be "no." However, if you were instead to ask "Should I go to college," the answer would be a resounding "yes." While you don't need a degree to be a fashion designer, earning one can benefit you in many ways. You won't realize one of the most tangible of these until you begin to look for a job. 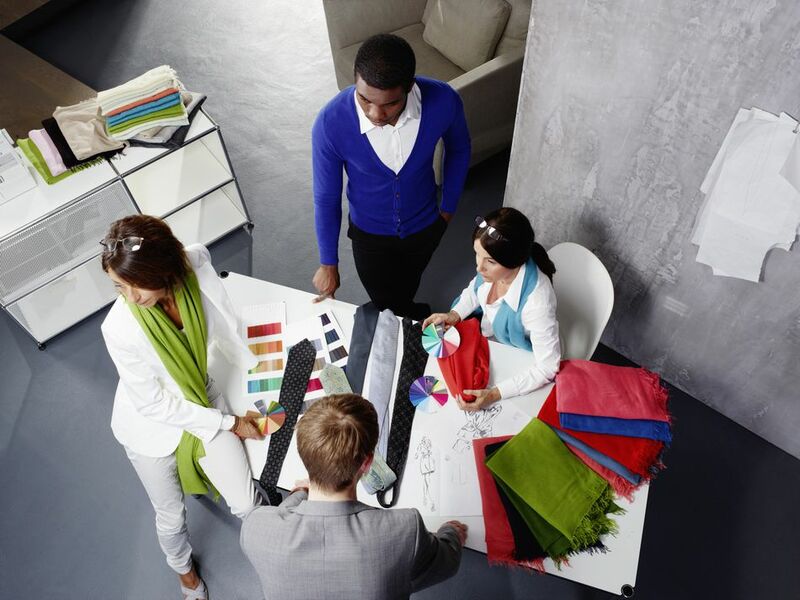 You will be faced with intense competition and many of your competitors will have a degree in fashion design, most often from a four-year college. Even if you do manage to get that first job in the fashion industry, without a bachelor's degree your chances for advancement will be hindered by your lack of a formal education. Your marketability is not the only reason to opt for getting a degree. Earning a degree in fashion design will allow you to improve your technical proficiency as a designer. You will be able to build your portfolio. You will learn how to think critically and gain business acumen. As a fashion design student, you will be presented with opportunities you wouldn't get anywhere else: access to lectures and workshops with professionals who work in the industry; a chance to participate in fashion shows and competitions; and access to internships. You will be taught by faculty members who currently, or who have previously, worked in the industry. You will have the opportunity to be critiqued and mentored by them. Your tuition will allow you access to career and job search advice while you are a student and, in many cases, after you graduate. If you want to become a fashion designer, you will have to choose between attending an art and design school or a traditional liberal arts college, and earning a BFA (Bachelor of Fine Arts) degree or a BA (Bachelor of Arts) degree. Art and design schools always offer BFAs and some also have BA programs. Liberal arts colleges always offer BAs and some confer BFAs as well. When you are enrolled in a BFA-granting program the emphasis will be on your studio classes, for example, the ones in which you will learn about fashion design. You will earn about two-thirds of your credits in studio courses and about one-third in liberal arts courses. The reverse is true if you plan to graduate with a BA: two-thirds of your credits will come from liberal arts coursework and one-third from studio coursework. If you want to leave your options open or if you plan to minor in a non-art related field of study, you should attend a liberal arts college. There are hundreds of liberal arts colleges and, by comparison, very few art and design schools. Learn as much as you can about any school to which you want to apply. Look for programs that are well respected in the fashion industry. To get you started, check out The Council of Fashion Designers of America website. You will find a list of schools that participate in that organization's scholarship program. Your college education will not be complete without an internship. Many colleges require that you do one but if yours doesn't, you should anyway. It will give you the opportunity to see what it's really like to work in the fashion industry as well as build up a network of contacts. What Can You Do While You're Still in High School? Many people know early on that they want to design clothing or accessories for a living. You may be someone who sits in math and history class dreaming of the designs that pop into your head. Pay attention to your teacher because, whether you apply to an art and design school or a traditional college, your grades will matter. You will also have to take a fair number of general education classes in college so what you learn now will help you later. Keep thinking about fashion design though, without neglecting your other schoolwork. Take any relevant classes your high school offers. You should learn how to sew and sketch, even if you have to do it on your own. That way you can start creating clothing and accessories and building a portfolio. Visit fabric stores so you can begin to learn about differences in content, patterns, and textures. Keep up with current fashion trends. Read magazines like Vogue and Women's Wear Daily. Follow designers and fashionistas on social media. Look into pre-college programs at schools that offer a degree in fashion design. You can attend these while you are in high school. They usually have weekend and summer programs. Speaking of weekends and summers, work in a clothing store so you can get to know what things people like. The fashion industry is centered in big cities like New York and Los Angeles. You may have to relocate in order to get the job you want. The following is a list of qualities employers are seeking in fashion designers, taken directly from actual job announcements. There is a good chance you won't be able to begin working as a fashion designer right after you graduate from college—many people start their careers as pattern makers or sketching assistants—but, since this your ultimate goal, it is important to be aware of what employers expect of those whom they will hire for those positions. "Knowledge of customer needs/wants as well as current and emerging trends with the ability to translate into brand-right product, balancing core and fashion." "Bring cohesive, seasonal, thoughtful, brand-right, strategic ideas to concept." "Understanding of production process and development." "Mac skills using Illustrator and PhotoShop applications." "Must be happy and have a positive attitude."